UK’s Chancellor of the Exchequer, Philip Hammond delivered his first Autumn Budget Statement yesterday announcing plans to increasing spending while abandoning the previous government’s plans to reach a surplus. While lowering growth forecasts, the UK is expected to spend on housing, raising the national minimum wage, increase in personal allowance among other things. While the GBP was muted to the news, the currency managed to stand firm towards yesterday’s close despite the stronger dollar after the FOMC meeting minutes. EURGBP (0.8478): The EURGBP closed with a bearish outside bar yesterday as the renewed selling in the euro and a stronger British pound saw the EURGBP exchange rate fall to a fresh two-month low, closing at 0.8481. 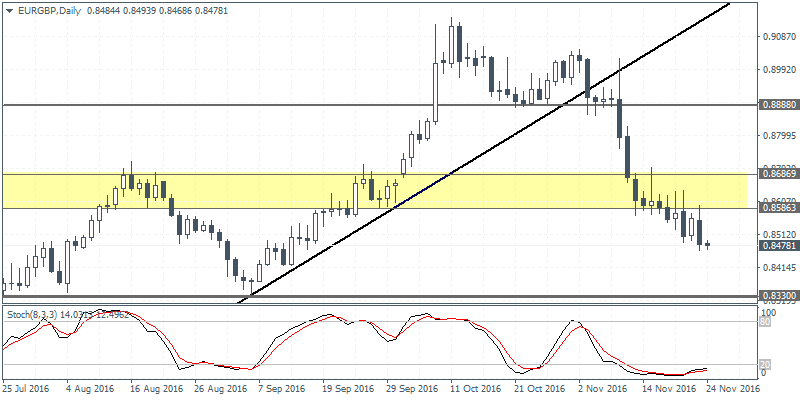 With the price now breaking free of the support level near 0.8687 – 0.8586, further declines could see the euro slide towards 0.8330 support, testing the September 6th lows. The euro could be seen finding support at this level, and if it does, a rebound in prices could see a possible head and shoulders pattern take shape on the daily chart, which could see further declines over the coming months. Our preference: short positions below 0.8520 with targets at 0.8450 & 0.8415 in extension. 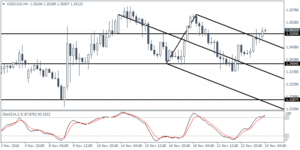 Alternative scenario: above 0.8520 look for further upside with 0.8570 & 0.8640 as targets. USDCAD (1.3512): USDCAD extended its gains to 1.3500 following the rebound off the support near 1.3400. With the potential for resistance to form near 1.3500, USDCAD could be pushing lower and thus a daily close below 1.3500 could confirm this view. Alternately, if USDCAD posts a bullish close above 1.3500, the price could be seen retesting the previous highs near 1.3530 ahead of further gains. On the weekly timeframe, USDCAD is currently flat, but a bearish close on the weekly could confirm the expected declines to 1.3221. Our preference: long positions above 1.3460 with targets at 1.3565 & 1.3590 in extension. Alternative scenario: below 1.3460 look for further downside with 1.3400 & 1.3375 as targets. NZDUSD (0.6993): NZDUSD is looking to resume its declines after the bearish close yesterday. But prices could remain choppy, trading within the support zone of 0.7046 – 0.6982. A convincing close below 0.6982 on the daily time frame will indicate further continuation to the declines as 0.6870 comes into focus. 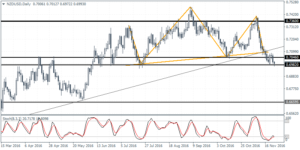 The head and shoulders pattern on the NZDUSD’s daily chart remains in play with an eventual target towards 0.6725 and 0.6659.